The Venice MainStreet website serves as a complete resource for businesses and visitors in Venice, FL, and receives more than 8,000 visitors a month, KarmaMarketingandMedia.com reports. 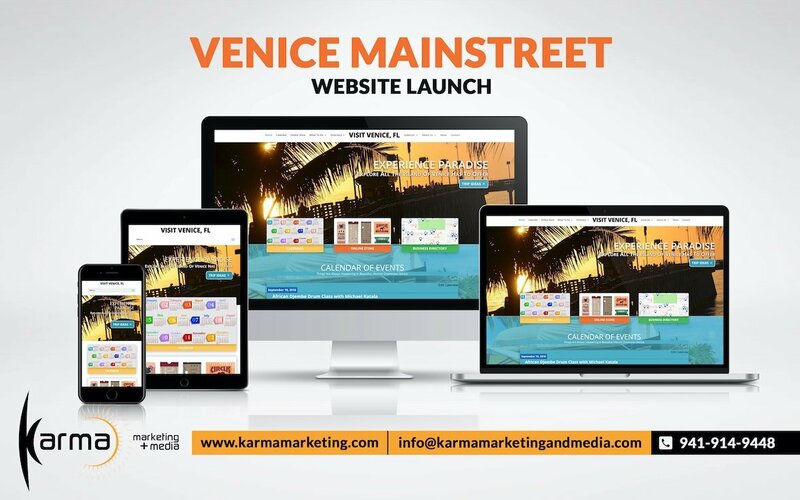 (Sarasota, FL) Karma Marketing + Media announces they have recently completed a new custom WordPress website for Venice MainStreet. The site serves as a complete resource for businesses in Venice, FL and receives more than 8,000 visitors each month. As a result, these businesses obtain extra exposure. Furthermore, the site serves as the main online resource for the Venice, Florida calendar of events. “We are very proud of the Venice Website Design as it provides businesses with the exposure they need to succeed. Brand visibility is of great importance when it comes to generating new leads, and this site ensures the member businesses obtain this visibility. Thanks to the online business directory, every business that chooses to become a member is promoted along with the events they are hosting,” Michael Given, the owner of Karma Marketing + Media, reports. The Venice web site distributes weekly E-blasts that reach more than 10,000 individuals to promote the events and businesses. Furthermore, there is an online store on the site where visitors can purchase tickets and merchandise. Venice MainStreet remains committed to preserving and enhancing the character, beauty, economic, and community vitality of the historic downtown and this is reflected in the items featured in the store. “A person can easily visit the store before learning about things to do in and around Venice. Check out annual events, upcoming outdoor activities, and the history of Venice in one visit. Everything a person could want to know about the area may be found on this new website we created. In addition, visitors find information about parking, as any time spent in the area should be focused on the beauty and charm of the businesses, not where to park,” Given continues. Every business is a brand, not simply a business. As a result, the website must reflect the brand. Karma Marketing + Media created this website to reflect the Venice MainStreet brand while still highlighting the brands of the individual members. Members find this benefits them in a variety of ways. “Our Web Design in Venice services are formulated to ensure our clients get the maximum exposure at all times. For this reason, every site we create emphasizes ease of use while drawing attention to the client. For this reason, we offer additional services, including social media, email marketing, and marketing strategy. Give us a call today and we’ll be happy to sit down with you and help you determine how to move your business forward,” Given states. Karma Marketing + Media is a full-service internet marketing business based in Sarasota, FL. They not only design and develop Google optimized websites, but also market them through Facebook, Instagram, Email Marketing, & CRM.